I bought a journal to use exclusively for this trip, but I type so much faster than I write. It might be easier for me to write a blog entry for each day rather than a journal entry. At any rate, I want to update my blog every day. Maybe blogging this trip is a fantastic solution. Today was much more intense than yesterday. Shannon and I went out on a self-guided walking tour all around London. The theme was the BBC TV show Sherlock. We set out with the intention of seeing the sites where the show was filmed. We started the day with breakfast at Speedy’s, the restaurant beside John and Sherlock’s flat. I ordered a mocha, a cheese omelette, and some chips, and I was not disappointed. Breakfast was cheap, and the atmosphere was fantastic. There were pictures inspired by Sherlock all over the restaurant. After Speedy’s, we headed for Trafalgar Square and found ourselves in the middle of a Pride celebration. Everyone was fun and friendly, and Shannon and I got free paper crowns. 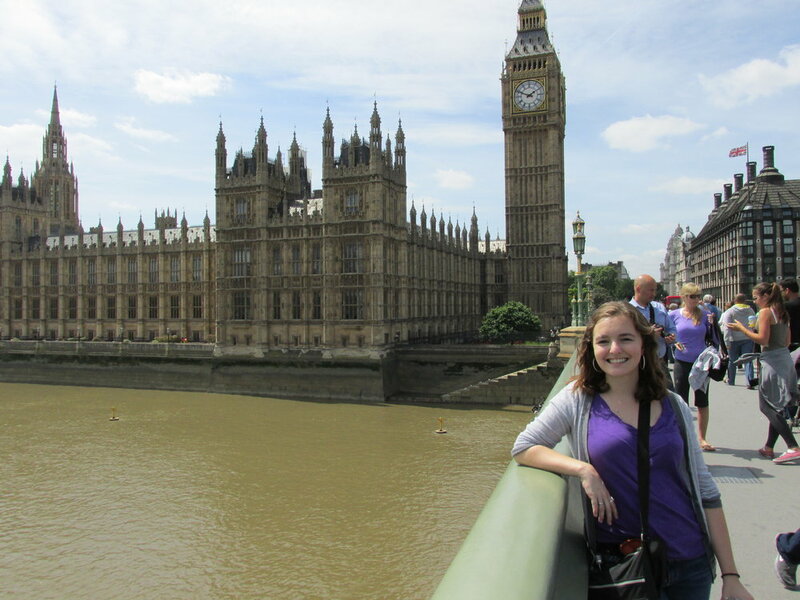 We also had the chance to take some touristy pictures, including some of Big Ben, The London Eye, and Parliament. 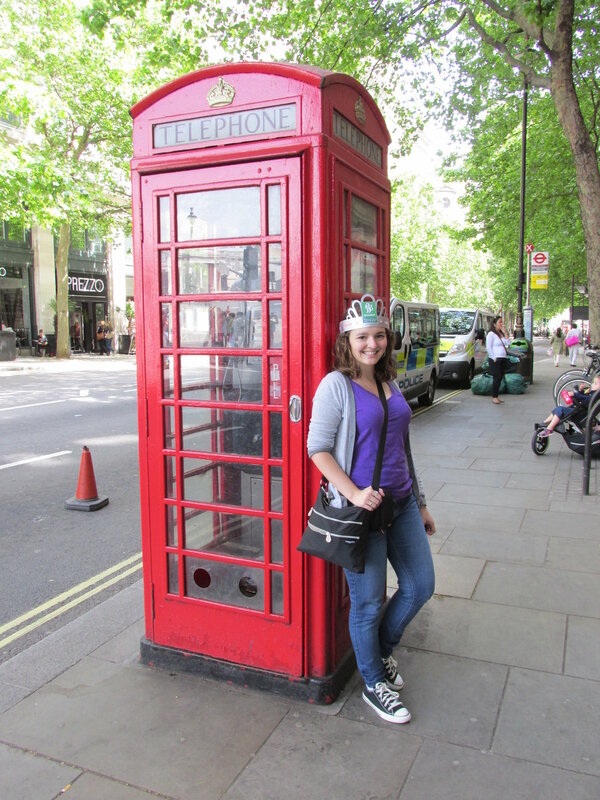 I also got the obligatory photo in front of a red phone booth. We went to the South Bank and a few other Sherlock-related sites, including St. Bartholomew’s Hospital (or St. Bart’s, if you like), where Sherlock had his infamous “fall.” We experienced a great deal of emotions. While almost getting run over by a double decker bus, Shannon and I met a woman named Ruth. She took us around the back of St. Bart’s to see where the Sherlock filming crew had filmed the final conversation between Jim and Sherlock. Ruth had been lucky enough to even meet Mark Gatiss and Benedict Cumberbatch! She was a wonderful woman. We said goodbye to Ruth after several minutes of chatting as well as taking pictures. Shannon and I, exhausted from walking, headed for the Underground. At first, we were apprehensive about taking the Tube, but once we figured out the map, we were feeling much better. We tapped in with our Oyster cards, headed downstairs, and got on the train. It wasn’t crowded, and we only had to stay on for one stop. We had lunch at Burger King (yeah, I know), hopped on the Tube again (much more crowded this time), and went back to the college. Once back, I took a shower, called my parents, and killed some time before heading over to see what Shannon wanted to do. We were initially set on meeting up with some people, but after a failure in communication (oh, Europe and its difficulties), ended up making a Tesco run and coming back to the dorm for pizza and Cabin in the Woods. Honestly, though, it was not a bad evening. Tomorrow morning, we’re all going as a group to see the Tudor estate, Hampton Court. Is it weird that I’m excited? I did just read a book on Tudor pregnancies, after all. Anyway, I think I’m going to call it a night. I cannot wait to see what tomorrow has in store. Just come across this this while looking for something else while organising a student trip to guess where … Nice to get a shout-out. I miss London so much. Thanks again for guiding us around a bit! Hope all is well on your side of the pond.